· The Espinosa (sell out) reason. As mentioned above, I like a very-peppery Zinfandel, and Espinosa has a great one. Unfortunately, I am not the only one who likes their Zinfandel — their last release sold out in just two weeks. Two weeks! Needless to say, it makes sense to buy lots of it when it is available, requiring extra storage. · The Palomar Mountain (party) reason. Sometimes you want to buy a lot of wine in advance of a large gathering or party. In my case, we’re holding a family reunion in San Diego this summer. Now the family name is Trovato, and Palomar Mountain just happens to have a blend that they have named Trovato…. · The Poppaea (aging) reason. Most red wines get better with age. Generally speaking, the higher the tannin level, the longer the wine needs to be aged. I call this the Poppaea effect because Poppaea makes a red wine from the Sangrantino grape. This grape has a very high tannin level, so it requires ten years or more of aging to get close to its prime. In some sense, this is an out-of-sight, out-of-mind issue, namely you are not likely to open a bottle of wine that you really want to age if it is not sitting in your house. So, what to do, what to do? Well, you can spend a lot of money on a wine storage cabinet, some of which I show in the About section. But there is an alternative, namely taking your wine to a commercial wine storage facility. To this end, I have arranged a deal with Chateau 55 to give you a discount. Chateau 55 is a state-of-art wine storage facility on Sorrento Valley Road just south of the Carmel Mountain intersection. They offer both full lockers and community lockers to hold your wine. The upstairs lockers are the smallest full lockers with 13 cubic feet of storage space, enough to hold around 8 cases of wine. They run $19.50 per month. The lower level lockers are larger (18 cubic feet, enough to hold 12 cases of wine) and run $36 per month. If you rent a full locker you get a fob that allows you access to your wine on evenings and weekends. For the community locker option, you pay between $4 and $5 per case per month, ideal if you are looking to store less than 4 to 5 cases of wine. However, the community locker option does not come with a fob, so you can only access your wine during working hours. For the rest of the review go to his website, So. Cal. Winery Review. When it comes to proper wine storage, some may jump to the conclusion that it’s similar to that of beer or spirits. However, due to wine’s lower alcohol percentage, it is a perishable item that can spoil quickly when not kept in ideal conditions. If you have a collection of fine wines that are made and bottled to become better with age, take the time to create a long-term wine storage system that effectively keeps your wine collection tasting great and aging well. How Does Wine Storage Differ from Beer or Spirits? When collectors or sommeliers are aging their wines, they are careful to store them differently than they would beer or spirits. Brown or clear spirits can be aged in a dark, cool area like a pantry indefinitely. However, wine is not shelf-stable, so it must be kept in specific conditions as outlined below. You may notice that many wine bottles are tinted to keep light out of the bottle. Although this practice does help to defer light from reaching the wine, it is not completely effective. Just like aging beers, it’s important that any wine you are aging is dark without any light fluctuations. Find a space in your home or cellar that can be kept consistently dark and away from any direct light, such as in a cool basement or dark cupboard. Ideally, the space in which you choose to store your wine collection will be around 55 degrees to delay chemical reactions that can cause your wine to turn bad. To age wine with the best end taste and results, it’s important that temperatures are kept consistent to allow proper characteristics to develop over time. If you are choosing to age your wine in a dark area of your home, make sure that the wine is away from any heating or cooling units like boilers, air conditioners, or heating vents. How Should Wine Be Positioned While in Storage? People often age beer and spirits upright, as it is the natural orientation of the bottles. However, these types of alcohol do not use a cork to age the product correctly as wine does. This is the reason wine bottles are most often aged horizontally, as this practice keeps the cork moist and prevents it from drying out. Storage can differ between wineries, with some choosing to store horizontally, while others may store their bottles upside down to maintain moisture throughout the entire cork. As you probably found from the above tips, moisture matters when it comes to storing wine. The cork is key to aging wine correctly, so try to keep the area that you store your wine quite humid as compared to where you would typically store beer or spirits. 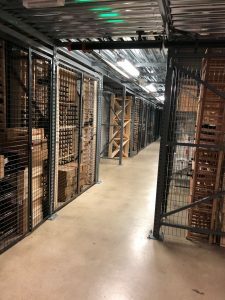 A humidity level between 55 to 75% is ideal, but these levels are usually only safely achieved with a specialized system or at a professional wine storage site, as high humidity can cause damage to surrounding areas. No matter if you’re collecting fine wine, beer, or liquor, make sure that they’re kept in the proper storage conditions to maximize their flavor and your end results. Are you a serious wine collector who’s looking to level-up your wine purchasing practice? If so, buying wine at an auction may be the right next step for you. These lively events are not only fun, but educative, with plenty of impressive collectors and passionate sommeliers to chat wine with while you sip at delicious samples. When it comes to sourcing and purchasing fine wine for your wine collection, there is no place quite like a live wine lot auction. There are quite often rare bottles and products that you won’t find at many merchants or even wineries. Although the live auction environment is stimulating and exciting, some collectors choose to bid online for their favorite rare vintages. If you do plan to do some bidding at a live auction or online, it’s beneficial and cost-effective to have an idea of the style, items, and bottles that you plan to bid on. Take time to do your research beforehand to see what specific wines have previously sold for, and go in with a general budget of what you’d ideally like to spend. At a wine auction, there is often an index that allows you to see what wines will be up for auction beforehand. Find the ones that interest you, and research estimations of worth online. However, live auctions are just that – live – and people are known to pay much more or much less than what a bottle may typically be worth outside of the wine lot. Whether you’re an experienced wine auction attendee or are planning to have your first experience on the wine lot, there are plenty of people in the fine wine community who are always happy to answer your questions. Make small talk, discuss collections, and ask any questions you may have about a certain type of wine or how the auction itself usually plays out. Experienced collectors and auction-goers know that no wine auction is the same as the next, as the type of fine wine and array of varieties up for auction are always changing. Some wine lots may be known to undervalue their wine, while others typically mark up their wine. Some wine lots offer mixed lots, a collection of a variety of wines of the same wine. Be smart about how you go about your next wine auction experience. With the right strategy and proper research, you may be able to find some spectacular wines to increase the value of your collection or to simply enjoy during a celebration. Whether you’re moving or simply want to store your wine collection at a professional temperature-controlled facility, it’s important that you know the best practices to safely and effectively complete your wine transportation. You’ve invested both time and money collecting your wine, so why would you risk its integrity with a DIY move? If you’re looking for professional wine transportation or hiring a refrigerated moving van, use the following tips to move your wine safely from point A to point B. Do you have a large or high-value collection of fine wines? If so, it may be a worthy investment to have your collection professional appraised before you hire a wine transportation specialist. These professionals will be able to help you get an idea of the estimated worth of your wine so that you can let a wine moving business know. Additionally, having your collection appraised allows you to notify a wine storage company of your collection’s value so that you won’t have to take that step later. In Southern California, the temperatures can get extremely warm during the summer months, making wine transportation risky. Thankfully, there are climate-controlled vehicles available to transport your collection where you need it to go. Whether you’re moving into a new home or transporting your wine to a temperature-controlled facility, these professionals will use their expertise to get the job done right. How Should You Pack Your Wine for Moving? One of the most important steps in wine transportation 101 is ensuring that you’re packing your wine correctly for a safe move. Pack all bottles on their side, and be sure to keep the bottles closed for seven days after they’re settled in their new home to preserve flavor. If you decide that you’ll be able to manage a move by yourself, find professional-grade boxes used by retailers or wineries to transport their boxes. They may be available for purchase at wineries, merchants, or here at Chateau 55 so check your local area. At Chateau 55, we’re proud to provide Southern California residents with best-in-class wine transportation services all over the region. From professional hand-packing services to the logistical planning of your wine transportation process, we’re here to support you every step of the way. If you’ve previously had your collection appraised, we provide cargo insurance for the entirety of your wine moving service and are dedicated to delivering and unloading your wine safely and successfully. For more information on Chateau 55’s wine transportation service, call us at 858-373-9463 today. Our experienced professionals can help you keep your fine wine collection in its best condition throughout its transportation journey. Whether you’ve already forayed into the world of online wine purchases or are hoping to expand your wine collection and want to learn the ins and outs of buying wine online, we’re here to help you feel more comfortable to shift your purchasing practice to the digital realm. Although the process may seem intimidating at first, there are easy methods that wine collectors can use to streamline the online wine ordering process and add to their impeccable wine collections. In America, the shipment and transport guidelines for wine vary between states. For the most part, shipments can be made from state to state easily and without obstacles. However, there are some states and regions where the rules dictate that wine shipments cannot be brought into the state from a retailer, while others don’t allow wine shipments at all. Before ordering any wine online, make sure that you take the time to research your state’s legislation on having wine delivered to you via mail. When it comes to wine, many collectors have their clear winery preferences. These are the wineries that are consistent with their product, service, and value, with many of them offering online discounts to registered members. If you’re an experienced wine collector who’s looking to add rare finds to a collection from a winery you’re familiar with, choosing to buy directly from them may be the most cost-effective route to buying wine online. Just like other online shopping practices, it’s easy to get carried away when finding enticing bottles to add to your “cart.” However, when you go online with a clear budget and a list of ideal bottles that you’d like to add to your collection, it’s that much easier to complete your shopping without regret or feeling like you’ve missed out on a good find. When you’re buying your wine, you want to trust the merchant that you’re purchasing from has a reputation for providing best-in-class services. Thankfully, online shopping allows you to easily find previous customer reviews can help you ensure that your online wine ordering experience will be a pleasant and satisfying one. It may seem counterintuitive to only use an online ordering service during certain times of the year, but it’s important to remember that wine and heat do not mix. During warm seasons, bottles that are shipped will most probably spend some time in hot delivery trucks, so try to avoid ordering from wineries or merchants that are far away from where you are. When you utilize the above best practice tips and tricks for online wine ordering, you can feel confident that you’ll be able to expand and enjoy your wine collection for years to come. The search for the perfect bottle of North County wine can be a daunting affair. How can you possibly decide when presented with such a wide variety to choose from? The simple fact is that there is a wine that fits right with your palate and budget; finding it is going to be tricky but not impossible. Not everyone who walks into a wine store knows exactly what they want. Besides, asking questions helps you get better at selecting the perfect wine to serve at events. And above all, salespeople want to help – it’s their job! Another benefit to asking questions is that you build a relationship with the staff, who in turn learn about what you like. Based on that information, they might even suggest something new in North County wine for you to try. Burgundy is a popular wine making region in France. Wines from this area will cost a lot of money given its name and the quality it can produce. But you don’t have to break the bank to enjoy a good bottle of wine. What you can do instead is go for wines made in regions surrounding the popular one. It’s not a step down when it comes to quality either as the grapes grown in such regions are the same. They just don’t have the well-known name working for them. For example, Pinot Noir is a red wine grape popularly associated with Burgundy. But you can get the same quality from areas like Mâconnais in southern Burgundy. Your taste preference has a lot to do with how you will enjoy wine. Wine can be dry, off-dry, medium dry or semi-sweet, medium sweet, or sweet. Without tasting, how can you know what you are getting? The answer is written on the label, and the particular listing you’re looking for is alcohol by volume (abv). Although the abv. listing is sufficiently reliable, taste can still be fairly subjective. For example, what might be sweet to you may just be mild to another person. That said, a bottle with an 11% alcohol level or higher is fairly dry. Then again, where the grape is grown will also impact the way the wine tastes. For example, Muscat can be considered dry but it gives off a sweet smell. Marketing an item costs a lot of money, so you can expect that to reflect when you check the bottle’s price. To avoid the shock, go for brands that aren’t yet quite known. Nothing is stopping you from buying the expensive variety but if you’re still in the stage of trying to figure out the North County wine you like, it’s best to avoid wines that have been marketed extensively. Not everyone immediately finds a wine they like and stay loyal to in years to come. Selecting the perfect wine is a process that will take a while, but the journey will be worth it. And of course, never forget about proper wine storage to ensure that your money isn’t wasted. San Diego is known to have a variety of local wineries, vineyards, and tasting rooms. This means choosing the best wine to serve at a party can be challenging with all the choices available. While we do not sell wine from our San Diego wine cellar, Chateau 55, we know that many do. And while we’re mainly a wine storage facility, we have a bit of experience when it comes to knowing which wines go with which foods. So below we’ve compiled some tips you might like to follow if you’re having some trouble choosing wine for your next event. These go well with so many foods but most especially seafood. Wine expert Joe Campanale recommends Muscadet, a dry and inexpensive white wine that goes best with oysters or when planning a raw bar because of its briney minerality and acidity. Riesling, on the other hand, is recommended for its ultimate flexibility. It is the white wine for whatever you are eating. With a huge variety of red wines, food pairing will require a bit of choreography. Light reds, for example, go well with dark leafy green vegetable dishes, while bold reds go well with foods that have a chewy texture, like red meats. When it comes to aged reds, there is no one formula for food pairing. A bit of experimentation is required. As for fortified wine, serve it with desserts but make sure to match the sweetness first. A good example of red wine pairing is Zinfandel with red meat, pasta, or pizza. Another one is Merlot with pork, beef, or lamb. Now that you know your food pairing, time to know which wines make the best options for your party. Pinot Noir from the U.S. In addition, you also need to know the order with which wines are served. White wines should be served before reds, especially during formal tastings. But the rule may be ignored in a casual party. When serving sparkling wines, this should be done at the very beginning to excite the guests’ palate. Wine serving should be done from lightest to heaviest, which means a light-bodied white wine should be served before a full-bodied red. In deciding which one is lightest or heaviest, you need to consider the age. Compared to a young Sauvignon Blanc, for example, an aged white Burgundy will have a more intense taste, so it has to be served last. `The sweetest dessert wines should be served after the dry wines. If two wines have similar intensity and weight, the sweeter one should be served after the other. So, between a dry young Riesling, and a sweet young Chenin Blanc, you serve the former first. Now you have a good idea which wine goes best with what food and how to serve them. Already have a wine collection? Contact San Diego wine cellar Chateau 55 today for more information on our wine storage units and new state-of-the-art facility. https://chateau55.com/wp-content/uploads/2018/01/shutterstock_393632659.jpg 277 500 Chateau55 https://chateau55.com/wp-content/uploads/2017/09/Chateau55_Final-Logo__VER2-1.png Chateau552018-02-22 10:00:552018-01-24 22:00:11Which Wines Are Best Served at a Party? With plenty of local vineyards around and some of the best wineries and tasting rooms, it wouldn’t be a surprise if you wanted to start your own wine collection in San Diego as well. If you’re interested, we’ve listed some tips for research, sources for information, and wine storage units that are available locally in San Diego. Want to get started on your own wine collection? You don’t need a ton of money, but there are a few steps you should go through first in order to get off on the right foot. Your research can run from basic to advanced, with a bit of reconnaissance involved. With all of the local wineries and vineyards in San Diego, you can do your homework online. Basic research involves point scores, credit ratings, vintage reports, tech sheets, tasting notes, retail price, and vineyard location. Intermediate research involves creating a winemaker’s profile, looking into the history of a winery and the region’s wine, aging and importation, and a look into other wine producers and when the vines were planted. Advanced research involves in-depth work such as branding, distribution, exportation, and wine-making ideology. This will provide the answer as to what wines to collect. If you’re interested in a particular bottle or brand, try it out and drink it over a period of time. According to experts, this will teach you more about the wine you want to collect. If you intend to collect a huge variety, then develop your palate for each variety. Check out this article we wrote on wine tasting tips. San Diego has no shortage of wineries and wine producers. Local shops happen to be one of the best sources for good wine. Now all you need to do is to find a source or two that can supply you with the amount of wine you need and with a consistent quality. Your wine collection will go to waste without proper storage. It is important that you have the right system in place when it comes to wine preservation. Chateau 55 strives to provide our clients the best wine storage units San Diego has to offer. Climate-control, security, and lighting within our San Diego wine cellar are consistently monitored so that your wine collection can age as it should. The lifecycle of wine will depend on the alcohol content’s volatile nature. It is important that you know the prime drinking window of your wine collection so you can drink, sell, or trade them at the right time. Chardonnay-based wines have a cellar rotation of about a decade or so years. Nebbiolo wine has a life cycle of around two decades or more. Vintage Madeira and Port require at least 100 years of cellaring. Your taste can change over time, so it is smart to periodically reassess your wine collection. Doing so not only helps you consider or reconsider your former choices but also confirm the current state of a wine’s quality. Take advantage of the Coravin, a tool that lets you test a wine without opening a full bottle. Start your own wine collection following the tips listed above. 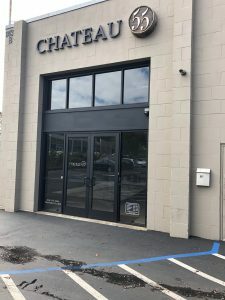 For more information on wine storage units San Diego, contact Chateau 55 today!